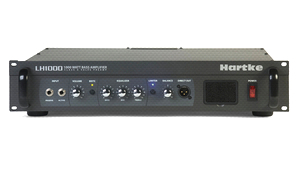 KitMonsters – Hartke LH1000. The music makers’ guide to making music. Combining a classic Class-A tube front-end design with a solid-state output gives this amp the best of both worlds, with the renowned warmth of tube circuits and the reliability and power of a solid-state system. With up to 1000watts available in several dual parallel modes, this amp head has more than enough power for any gig setting. The controls on the front panel allow you to accurately shape your sound, with bass and treble shelving, as well as mid-peak EQ and a selectable ‘brite’ switch for added high frequency response. This can drive several different cabinets, and the output resistance is variable, giving extra flexibility when travelling with just a head and using different speaker cabinets. The rugged rack-mountable metal chassis and steel handles make sure this amp is a reliable addition to your live bass rig.